Ultrasonic vibration (UV) machining is a process in which micro-scale high frequency vibration is added on the cutting tool to improve machining performance. Its principal is to make the interaction between tool and workpiece a periodically separation, and the direction of the friction between tool and chip is changed in each cycle of the ultrasonic vibration. In this paper, the mechanism of ultrasonic vibration cutting, the effects of ultrasonic vibration on the forces, temperature, stress and chip shape during orthogonal cutting of Ti6Al4V material are studied with finite element method(FEM). The conventional and ultrasonic vibration cutting are simulated using Arbitrary Lagrange-Eulerian(ALE) approach in ABAQUS/Explicit. Taken forces as index, the effects of cutting speed (40 m/min, 50 m/min, 60 m/min ), feed rate (0.08 mm/r, 0.12 mm/r, 0.16 mm/r ) and back engagements (0.1 mm, 0.3 mm, 0.5 mm ) on metal cutting are investigated separately by single factor test. The simulations are validated by the experimental findings and analytical data. The results show that the cutting forces, stress and temperature of ultrasonic vibration cutting are much smaller than conventional cutting. 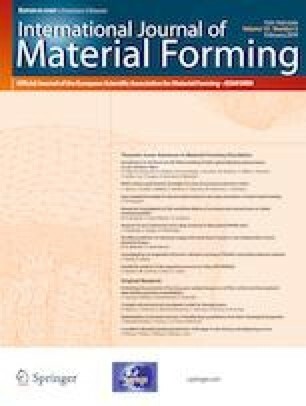 The authors would like to thank Shanghai University of Engineering Science for providing financial support for this paper. Also, the authors would like to thank the editor and the reviewers for their constructive comments and suggestions.